Depending on the job title, company, and where the listing is posted, hundreds of resumes could land on a hiring manager’s desk when there is an open position to fill. With so many candidates, the average manager spends less than 30 seconds scanning each resume before tossing them into one of two piles. The best of the best resumes will be put in the much shorter “yes” stack, while most will be placed in the recycle bin without a second glance. While searching for a job can be overwhelming and competitive, being prepared and applying for the right position in the right way can easily place you in front of the crowd. From your contacts to the resume itself, this article will guide you through landing the interview and the hours of work that go behind it. Being referred by current employees or friends of the employer can be the fastest way to land an interview. Don't be afraid to allow people to help you with your job search. Employers are more likely to hire people they trust, and if you have a source of credibility who can talk to the hiring manager, your chances of landing an interview are increased significantly. If you don't already know someone who can help you get an interview, networking is a great opportunity to find people who work at the company currently and others who are currently at a job you want to have. Find members of the team through career-related events and befriend them. Use face-to face network events to show business professionals that you are looking for a position in their field. The individuals you meet will likely remember you and affirm you to the hiring manager. While attending a networking event, be sure to take business cards from the people you talk to and bring a pen to write notes on the back of their cards. This will help you remember exactly who they were, what they have to offer, and you have their contact information in the palm of your hand. Online networking and ensuring you have a respectable web presence is also crucial. Or, as some employers say, if you can't be found online you don't exist. Make sure you have a way for people to get to know you and your professional history, as well as a way for them to contact you if needed. Create a LinkedIn account and keep it updated, especially during your job search. Be sure to utilize various forms of social media as well, such as a Facebook and Twitter. These platforms will help round out your online presence, but they can do more harm than good if potential employers are able to see posts that were only meant for your friends. All social media sites have their own privacy settings, so be sure to set yours appropriately before you submit a resume. Chances are, your future employer will at least perform Google search for your first and last name and you want the results to be respectable. A good cover letter can be just as important as the resume itself. Though the resume is extremely important for obtaining a job interview, many employers would prefer to read a well thought out cover letter that details the reasons why you want to work for the company and why the company should choose you. The cover letter gives you the opportunity to write about your leadership, passion and competency in a way that is more personable than the bullet list on your resume. Remember to address your cover letter to the individual who will be reading it; if you don’t know who that is, research or call the office and find out. It also would be helpful to have a supplemental online blog or portfolio in addition to a resume and cover letter. This will put you ahead of the curve when employers begin to choose who they are going to bring in for an interview. The best and perhaps easiest way to present your skills and career aptitude is to write a good resume. For specific information about resume tips, you’ll want to read through the Resume Writing Tips Guide < http://www.internationalstudent.com/resume_writing/writing_tips/>. It’s worth checking out since this is usually the first impression you’ll make with your potential employer. It’s important to have more than one person read it over, and ensure the formatting is consistent and easy to follow. Unless you have a great deal of related experience that you can’t narrow down, be sure to keep it to one page and always mold it for each new position you apply for. Reread the job description before tailoring your resume. Incorporating words that appear in the description is also a great way to show your skills and goals align with the company. Believe it or not, hiring managers will fact-check, so make sure that when you claim something on your resume you are telling the truth. There is nothing more embarrassing than stumbling over your words during an interview because you added too much fluff. Also, be ready to back up each of your bulleted points with examples and specific situations, because if you can’t show the hiring manager what you told them, you will lose credibility. 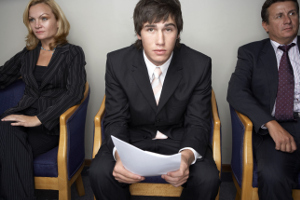 The time before you actually land an interview is crucial. It’s your networking, resume and cover letter that will ultimately decide if you get the opportunity to put on your power outfit	and make your case in front of the hiring manager. All of the hard work that you put into crafting a resume and perfecting your cover letter are just the first steps in an interview process and can seem like a daunting task, especially if the position is competitive or far-reaching. Don’t let the stress stop you from applying for a position that you want, because oftentimes interviewers will call in a few resumes that they were on the boarder for, simply hoping that the candidate blows them away in an interview. With hard work and determination your resume is sure to land on the “yes” stack!